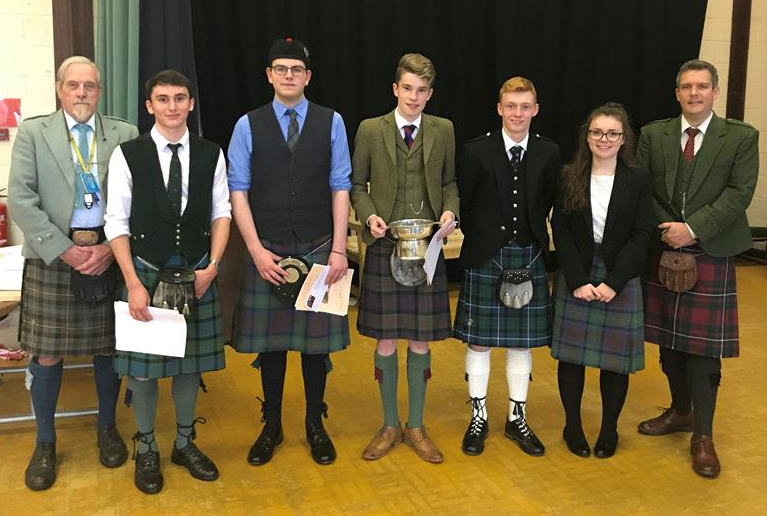 Pipers from as far afield as Edinbane in north Skye and Balloch near Glasgow took part in this year’s Iain Dall Young Pipers Festival, held recently in Gairloch High School. Judge Dr Decker Forrest said it was clear that local councils’ investment in providing tuition to young people in Scotland’s national instrument was “creating a generation of fantastic pipers” able to perform and compete to an extremely high standard. John A. McLaren from Invergordon won both the under-18 March, Strathspey and Reel and (for the second year running) the Iain Dall Quaich for Piobaireachd with a fine rendering of ‘The Old Men of the Shells’. Honours were shared by Ciaran Kellett (Kyle) and Archie Maclean (Edinbane) in the under-15 competitions. Ciaran won gold and the Iain Dall Chanter for Piobaireachd with ‘The Marquis of Argyll Salute’ and silver for March, Strathspey and Reel. Archie took gold for March, Strathspey and Reel and silver for Piobaireachd. The winner of the Flowerdale Cup (novice) was Ruaraidh Drennan from Drumnadrochit whose two older brothers have been distinguished Iain Dall winners in the very recent past. The chairman, Dr Ian Blake, introducing the judge and congratulating the pipers, welcomed parents and grandparents who had come to support them and who ferried sons and daughters to competitions all over the Highlands throughout the year. He reminded the audience how much the festival relied on the goodwill and generosity of sponsors like Alastair Pearson at the Old Inn, to say nothing of anonymous well-wishers who funded the prizes. The results were as follows: Competition 1 – March on practice chanter: 1st Hector Finlayson, Kyle; 2nd Giacomo Cecchini-Fraser; 3rd Kiera Whittingham. Competition 3 – Novice march on bagpipes: 1st Ruaraidh Drennan, Drumnadrichit; 2nd Sasha Westerduin. Competition 4 – Piobaireachd Under 15 years 1st Ciaran Kellett, Kyle of Lochalsh; 2nd Archie Maclean, Edinbane; 3rd Calum Dunbar. Competition 5 – Under 15 years March, Strathspey and Reel 1st Archie Maclean; 2nd Ciaran Kellett; 3rd Calum Dunbar. Competition 6 – Piobaireachd Under 18 1st John Alastair McLaren, Invergordon; 2nd Eòghainn Peutan, Kilmuir; 3rd Jamie MacRae. Competition 7 – Under 18 years March, Strathspey and Reel 1st John Alastair McLaren; 2nd Gilleasbuig MacVicar; 3rd Eòghainn Peutan. Competition 8 – The Ishbel MacAskill Memorial Prize for best original tune for pipes or fiddle Katrina Martin, Portree, with her “Lost at Sea” composition.